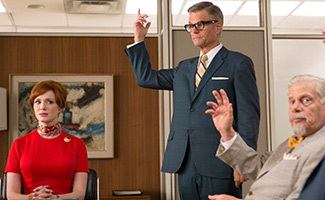 • The Writers Guild of America nominates Mad Men in the drama series category and Season 7′s “A Day’s Work” in the episodic drama category, according to the Los Angeles Times. • USA Today reports that Mad Men is one of the American Film Institute’s top 10 TV shows of 2014, making Mad Men the first show to appear on the list for each of its seasons. • Mad Men — which “remains insightful, confident, and more often surprising than not” — is one of Vulture‘s top 10 shows of the year. • The Hollywood Reporter has a clip of Vincent Kartheiser in Red Knot, a movie directed by Scott Cohen. • Blu-ray.com reports that God’s Pocket, directed by John Slattery and starring Philip Seymour Hoffman and Christina Hendricks, will be released on Blu-ray on Dec. 26.